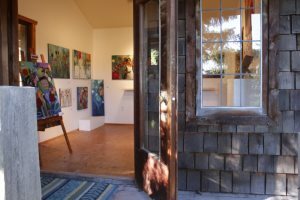 Moon Water Wind is located on the gorgeous, wild west coast of Canada, on beautiful Salt Spring Island, a home to many different artists. 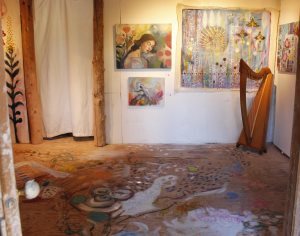 In this studio/gallery Yasmeen exhibits her new paintings, sells music CDs and prints of her original art, teaches private lessons, runs workshops, and performs intimate concerts for healing. Please see the events page for up-coming intimate concerts and new exhibitions being held at the gallery. An ongoing exhibition of Yasmeen's paintings and illustrations is open for viewing. If you are travelling to visit please schedule a time by contacting the gallery first, contact information is below. You can commission the artist by contacting her through the form below. To view Yasmeen's artwork visit the art page, or the Art Shop. 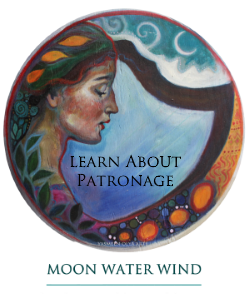 At Moon Water Wind, Yasmeen gives special one hour consultations-indepth lessons, in painting, harp playing, improvisation, singing and life planning. She mentor's select young person's in art, music and "Celtic" harp playing. Please contact via email for further details. 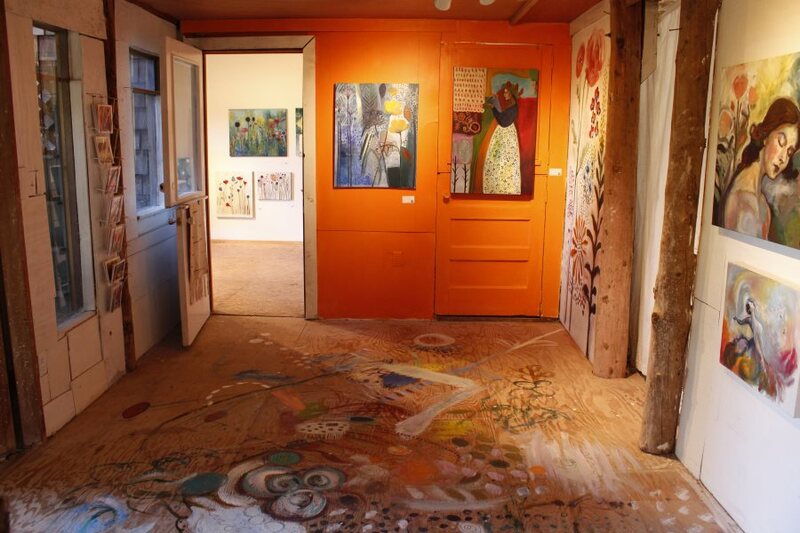 Today we are visiting Moon Water Wind - Art Gallery and Studio. It is June: the sun is hot and the ocean is blue. Coming off the little ferry onto Salt Spring, we are welcomed by purple martins flying by. It's Saturday so we spend part of our early afternoon wandering around the artisanal and local food Outdoor Market in the small village of Ganges. Delicious cheeses, fresh artisanal breads, organic fresh veggies, buskers, handmade jewelry, leatherwork; the list goes on. It is a thoroughly enjoyable way to spend pocket money and feel we are supporting the vibrant artistic and health-conscious local community. Having thoroughly enjoyed our stop at the market (so many smiling faces! ), we head out to Moon Water Wind - 730 Vesuvius Bay Road, a five-minute walk from the Vesuvius Ferry Terminal. We spy the sign, then park and walk up stone steps beside a little water feature. We arrive at a small deck where the signature sign is displayed, and we pass under an awning that shelters shelves lined with small cheerful flower paintings, baskets, plants; sea shells and stones are scattered about. Yasmeen is next door working in a garden, and waves to us as we walk up saying that if we need any help we can ring the bell on the deck. We step inside the Gallery-Studio and hear Yasmeen's music floating gently on the air. The first painting I notice is a visionary painting of a woman with her eyes closed; traditionally applied, confident brush work beautifully renders a gentle feeling. It is presented next to a veritable tapestry of colour and design on raw canvas that is pinned to the wall. Even the floor of the studio gallery is an abstract painting, and one wall is colourfully painted with whimsical, abstract flowers. Yasmeen's little harp is tucked into a corner. Yasmeen's paintings are interesting studies of patterns and texture, light and dark, colour and figures; an array of style, design and vision. It's original work you won't find anywhere else. 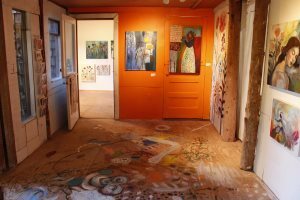 Her artist statement says she works a lot from her dreams and visions. 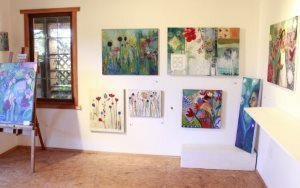 Looking through an open portfolio of her work, I can see that her watercolour paintings are illustrative and sensitive. I am going to commission her to paint a piece for a new kitchen I am having installed, so I ring the bell. Yasmeen is wearing her characteristic attire and relaxed head dress. She wipes her hands on her paint- and earth-covered apron. We exchange basic introductions and she thanks me for my interest in her gallery. We go over the details of the commission and she takes down my contact details, handing me her beautiful business flyer. She tells me that an exhibition of a new series of hers is going to be displayed in November. My friends and I purchase art cards, and get her to sign the music CDs we brought with us. We have already bought tickets to an intimate concert we will attend at her studio tonight. I'm totally entranced by now, kind of floating around: her presence, the gentle music, and the beautiful artwork are all transporting me. I feel this rush of gratitude, but unsure how to explain it, I just relax into it and feel held. She thanks us for coming and goes back to working in her garden. After dinner at the "Tree House Cafe" where healthy, locally-sourced cuisine can be had, we return to Moon Water Wind. It's a warm evening, with a sliver of a moon, and the ocean is not far off. Candles dot the way up to the brightly lit gallery, where Yasmeen's harp is now installed directly in the middle of the room. This particular concert is only for a few guests, and tickets had to be purchased early. Yasmeen's hostess welcomes us, hands us hand bills and we sit down. Yasmeen is a performance artist with the musical capacity to profoundly shake you, move you to tears, wake you up, and help you feel alive. Between pieces Yasmeen recites poetry and tells stories; each piece is like a waterfall cleansing you.